August 2, 2016 — The wild hillocks and the forests of Central India are a world of their own. Nestled on lush green foothills are intermittent clusters of villages, little touched by modern civilization. They are the ancestral home of an ancient indigenous tribe, the Baiga, which has had a symbiotic relationship with these jungles and their biodiversity, preserving them with their knowledge for generations. Tigers are classified as endangered Schedule I species under India’s Wildlife Protection Act, which offers them a high degree of protection from human activities such as hunting and poaching. The Baiga, for their part, are categorized as Particularly Vulnerable Tribal Group by the Indian government, a designation that safeguards the community’s traditional rights with respect to identity, habitat, sources of subsistence and culture in natural surroundings. Further, the Forest Rights Act, passed by the Indian parliament in 2006, guarantees traditional forest dwellers such as the Baiga rights of habitat and livelihood on jungles they had been living in or using before December 13, 2005. The Bhoramdeo Wildlife Sanctuary in the Central Indian state of Chhattisgarh, a 164-square-kilometer (63-square-mile) richly biodiverse forest, sustains pockets of Baiga. It also connects with the sprawling 942-square-kilometer (364-square-mile) Kanha Tiger Reserve in the neighboring state of Madhya Pradesh. 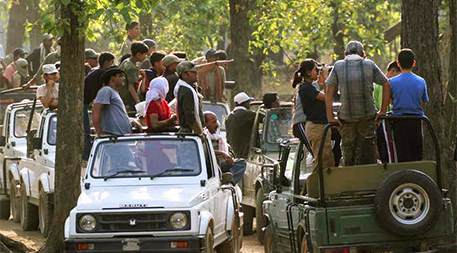 Home to some 85 to 100 tigers, Kanha is one of the largest habitat of big cats in Central India. It inspired Rudyard Kipling’s Jungle Book in the 19th century, and today it is a favorite destination of tourists looking to spot a tiger. They enter the reserve in queues of safari jeeps armed with cameras to catch sight of the charismatic cat. If they do manage to see one, often pandemonium ensues — with jeeps and noisy, excited crowds trying to jostle their way to the site. Distressed by the hubbub, many of the tigers migrate into the more peaceful forests inhabited by the Baiga — adding to migrations already occurring as a growing tiger population makes Kanha more crowded with cats. There they draw the attention of government and nongovernmental conservation entities. Although there is no legal provision allowing government officials to force relocation of villages from wildlife sanctuaries such as Bhoram Deo, local people say they’re being coerced to leave in order to accommodate the tigers and other wildlife. But Indu Netam, convenor of the non-governmental organization Adiwasi Samta Manch, which works with the Baiga and other tribal communities to secure indigenous rights, substantiates the elder’s claims. But does it have to be either/or? 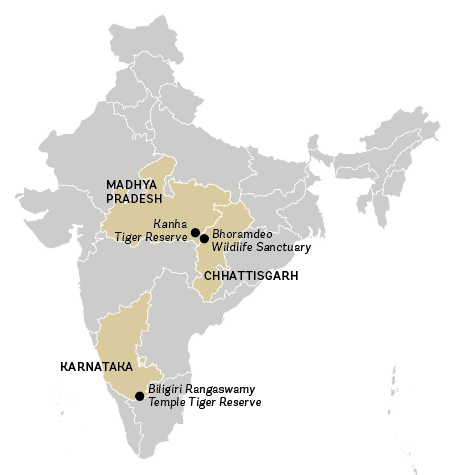 Recent government data on the status of the tiger population in the Biligiri Rangaswamy Temple Tiger Reserve in the South Indian state of Karnataka suggests not. 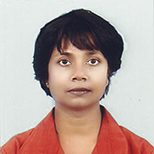 Source: Moushumi Basu. Click to enlarge. Historically a cave-dwelling, nomadic tribe of shifting cultivators and forest gatherers, the Soligas had been living in the BRT forests for generations. However, in 1974, when BRT was declared wildlife sanctuary, they were relocated in small settlements called porus in and around the forests. Some got small plots of land for sustenance; others took to manual labor. Gathering nontimber forest produce from the BRT (including honey, gooseberry and lichen) continued to remain the main source of their native food system and their rudimentary economy. Then, in 2006, the state government took away the Soliga’s rights to collect forest produce under the Wildlife Protection Act, impoverishing thousands of Soligas. And to make matters tougher for them, BRT Wildlife Sanctuary was converted to BRT Tiger Reserve in January 2011. This brought into question the fate of about 6,000 Soligas living in the core area of the reserve and another 10,000 acres of buffer zone — forest fringing the core area. What makes it possible for the Soligas and tigers to co-exist? For one thing, forest conservation ethicsare interwoven with the ethos and religion of the tribe. Protest marches and rallies led to months-long consultations and discussions with the government administration and forest department. 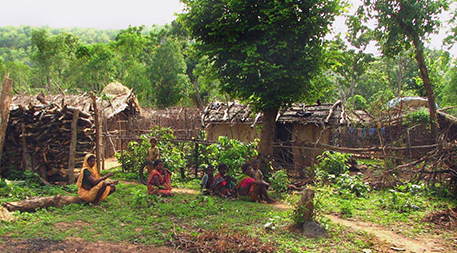 In October 2011, the tribe succeeded in formally securing its rights to habitat and non-timber forest produce collection in its ancestral land in the tiger reserve under the Forest Rights Act. Today, Soliga settlements are spread across all the five ranges of the reserve. If the Soligas and tigers can mutually co-exist in their battle for survival, can other indigenous communities such as Baigas take a page from their book? The parallel with the Karnataka scenario is indeed valid, and a solution must be found in Chhattisgarh too to allow the Baiga community and the tigers to coexist in the reserve areas, based on the experience with the Soligas. This kind of articles are needed to bring to public the threats the forest communities face on their sustainable life-heritages due to the business-oriented ways and so-called conservation policies of modern forest department in India. When visiting India I have seen huge monoculture plantations even in 'sanctuaries' whereas forests appear more biodiverse in those areas where tribals have still been able to manage the forests in their own way. The article is a stark reminder that tribals are very much a part of our forests and their conservation since time immemorial. It is time we value their traditional knowledge before it is too late in this rat race for development and deforestation. Well -written piece.